Thankyou Dejeselam Egziabher Yistilin For your updated info. it is really good news to our church. qeriwn melkam Zena yaseman Amen!!! Egziabher fisamewu yihunlen. Eredetu Ayelen. Amen. please don't disgrace the name wht we all it (a holy sinode) bcause the groups are not doing holy deeds, most of them are government agents in the church. think about their action! who is behind this mess? why weyane damp his main man? what is the main purpose of this qudeta? why the government want to diverte people attention to the church? why those gangista(synode)condem weyane for dessi masacer along with abba poulos. Let us not mix what should not be mixed. The church is the church. Politics is politics. Talking about church, we had better do for betterment and give church matters to the Almighty who accomplishes things in His own time and means. Hence, we must not preach hatred, discrimination and politics. you guys let us cool, it is God the Holy Spirit who helps the church. I think now God will doing His action to weakup all people. Prayers for church, abune paulose and abune filipos. I can not believe this and I can not wait to see the when our church administration got solved. Gena Egzihabher Menefes Kidus (Holy Spirit) will continue to do His worrk. Chere Wore Yaseman.Amen!. The person on top commenting that Kidus Sinodose as (gangsta) please do ur research or erashen bedegame bemenfesawinet gemegem..then you can speak!! Have you heard what the Patriarch said when told to leave the meeting.. the Patriarch said "the government is behind me".. when they were supposed to say "God is behind me"... They have the memeber in God's Temple, but they do not know God!!! What I meant on top is not that the Holy Spirit drives what the Patriarch is doing but as a Patriarich, they(esachew) are not supposed to rely on government but on God. It's just a beautiful example that they(esachew) do not know God. We are indebted to your reports especially these days on the Holy Synod case Deje selamoch. However, my mind is always questioning “Is the conflict really about the well being of our holy church or is a power trip” I mean don’t blame me for asking. In this era of woyane any thing can happen. I mean we are well experienced to be silent not to oppose any thing in that country including in our church matters. Remember the case of Addis Ababa St.Mariam Church case and military intervention some years ago, St Stefanos church and its complication. We are experienced that our church leaders are capable of crushing oppositions through military menses. Abune Stifanos is a young Abun who got his Abunian rank not so long ago from Abune Pawelose. 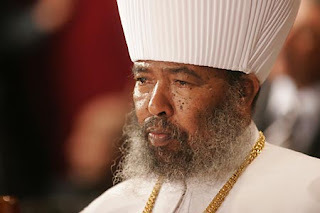 I am really confused the opposing groups is lead by pops from the same ethnic group to Abune Pawelos. There are so many possible scenarios that need to be checked!!!! Let the almighty God look us in his mercy full eyes and give us his ever lasting solution!